It's the incredible... Reverse Universe! Picture this: inside a cup of hot tea, a ghostlike shadow slowly takes shape, and then -- pop, out of nowhere there's a lump of sugar. It's only one of many oddities to be discovered when time starts running backwards. Weirder still, physicists agree that one day in the future, this might really happen, when the Universe displays the freakish burp of nature known as the Big Crunch. What goes up must come down. With that thought in mind, the entire Universe might one day decide to shrink. And shrink, and shrink, and shrink. Until there's nothing left. The Universe began some ten billion years ago, with the Big Bang. Out of nothing, a bulb of tremendous energy set free. Matter didn't exist. The only thing there was, was intense heat, and particles. Outside the bulb was nothing. No time, no space -- as a matter of fact, not even a place where the word `nothing' would have any meaning. To ask what was `before' the Big Bang or what is `outside' the Universe is a meaningless question. It would be like asking what continent is south of the South Pole, or what Bill Gates did before he was born. But the Universe expanded, at immense speed. It began to cool down, and matter slowly started to take shape. After 100,000 years, the first atoms formed. After 1,000,000 years, the first star flickered up. After 3,000 million years, a small star that later would be called `Sun' was born. And another 5,000 million years later, an astrophysicist named Edwin Hubble would prove there was such a thing as a `Big Bang' in the first place. Well, the Universe is still expanding, and cooling down. Time ticks. At least, that's what we experience from our point of view. Time as we experience it is governed by entropy: the natural tendency of things to go into a more chaotic, less energetic state. That sounds more difficult than it really is. When you throw a coffee mug on the floor, it will break up into a chaotic configuration of splinters, while throwing a handful of splinters on the floor will not create a new a mug. When you put a lump of sugar into your tea, the sugar molecules want to mingle with the tea molecules, creating chaos. The only way to beat entropy is to invest energy -- for example; by gluing the splinters of the broken mug together one by one. But in the end, entropy always wins. Mountains erode, the Universe cools, the Sun cools and will one day die, the Earth will eventually vanish, and all coffee mugs will some day be broken. Entropy is deepest, most profound driving force of the Universe. It defines time, ordering it to point towards what we call `the future'. But then, out of the blue, something completely crazy happens. Suddenly, the Universe stops expanding. And it actually starts shrinking again, like a balloon losing air. Some cosmologists assume this will indeed be the case. There may be too much mass in the Universe for the expansion to go on forever. The gravity of all matter in the Universe combined may cause the inflation of the Universe to slow down, come to a halt -- and after that, the Universe would start shrinking again. This would have unimaginable consequences. In a Universe that's contracting, everything goes reverse. The arrow of time points backwards. Amazingly, entropy would go the other way around. So there it is, the reverse-Universe. There are lumps of sugar coming out of nowhere and pieces of pottery coming together to form a coffee mug. Light will be mysteriously attracted to the Sun, and sucked into it. Atoms will want to form molecules as difficult as possible. Out of dust, mountains will form. Rivers will flow backwards. And you'll have to add cold to keep your cup of tea from becoming so hot it vaporizes and flies off. But you won't. As a matter of fact, you won't do anything -- since you're probably not there anymore. Although some theorists believe that in a reverse-Universe, the dead would rise again, living reversed lives until they vanish into nothing, it is unlikely this will happen. For one thing, our bodies simply may not be apt to contracting universes. The biological mechanisms in our bodies are run by entropy. We need entropy like we need oxygen. No entropy, no life. What's more, it will take a long, long time before shrinking day comes -- some estimates lead up to ten or twenty trillion years from now: 20,000,000,000,000,000 years. By that time, our Universe will have changed completely. 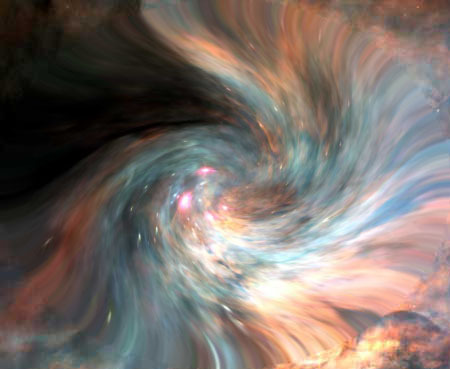 Entropy will have caused stars to fade out and black holes to vaporize. Matter will be divided evenly across the Universe. It will have no particular reason to form stars and planets or humans living backwards lives. Matter will just clot together, making a denser and denser Universe. Admittedly, it's all speculative business. But don't bother, you won't miss a thing if you're not there when the Universe contracts. 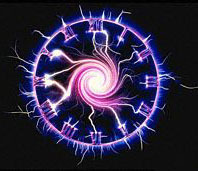 After some ten to twenty trillion years of rewinding, the Universe would eventually go zip, as if it never existed. It's the event known as the Big Crunch -- `crunch' in the mind of scientists apparently being the opposite of `bang'. But will the Universe really vanish? At the moment, most cosmologists don't think so. The latest evidence suggests that the Universe will keep expanding forever, becoming an ever emptier and colder place. Yes, that gives some problems of it's own -- but that's another story. However, the question whether the Universe will shrink or expand forever is still not completely settled. But then again, many theorists think that the Big Crunch won't be the ultimate end. As the Universe is shrunk back into a ridiculously tiny proportion known as the `Planck length', it would go Bang again. The Universe would expand once more, and everything would start all over again, ping-ponging us forwards and backwards in time forever. Oh, boy. Starting to feel dizzy already?